No, I'm not talking about barrels of wine. Today's necktie is yet another Jos A Bank Signature but it's a Signature Gold instead. It's another advertising thing like "new and improved" or something. Actually the Gold lines are a notch above the regular old Signature line and they are numbered as well -- like # 172 / 210 or so. This is the first time I've tried anything other than a gold or blue tie with the charcoal suit. I had taken a salesman's advice on the colors of ties up to this point but decided to risk a little and try my own hand in the conglomeration. 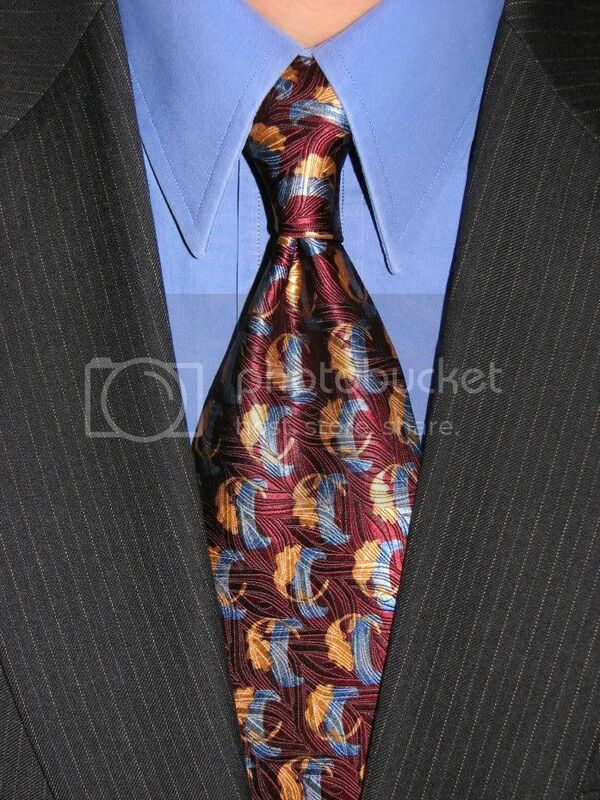 I think it works and the tie does have some gold and blue in the pattern. I knew better than to stray too terribly far. That's one of the very attractive things about ties -- you can change the whole look of a conglomeration just by changing the tie. The shirt? Just a regular old blue point collar. Well, French blue.